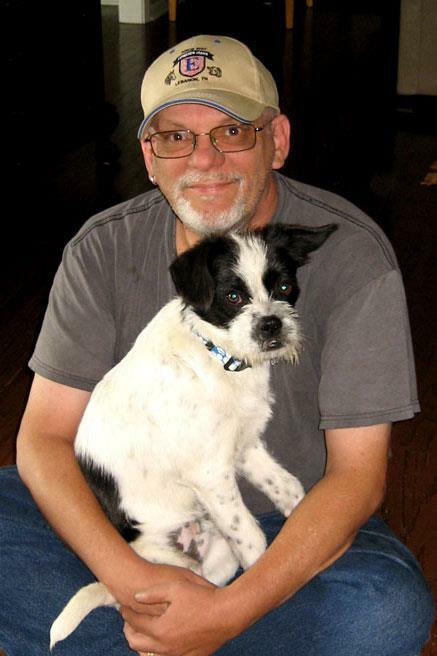 As long as I’m talking about Nashville buddies who have wonderful blogs, allow me to introduce you to Skip Adams! Skip Adams and I go waaaaay back. When I first moved to Naples, Florida, back in mid-1960s, I ran into Skip– literally, with my Corvair into the back of his car– and he was kind enough to forgive me. With his brother, Danny, we played some gigs with me trying to alter my nasty old Silvertone electric guitar to play like an electric bass. Nobody in Naples could play guitar like Skip, and that caused a lot of resentment. One time, I traded Danny something or other for a little motorbike, which I tried to keep a secret from my mom. When Mom found out, she went roaring over to the Adams’ house, spitting fire and planning to tell Skip and Danny’s mom a thing or two about the hooligan kids she had raised and how they were a bad influence on her little angel. Millie Adams became my mom’s best friend and they became even closer when my father passed away in Skip’s and my senior year in high school. They were a pair, those two, and set Naples on its ear! Skip and I played around in various band formats when he had to time to class up whatever I was trying to promote; high-school hops, country-club gigs, whatever. 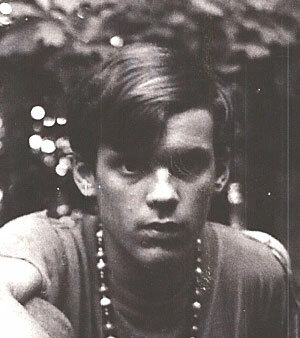 After high school, Skip stayed with his music and in a big way. In addition to his film and television credits as an editor, sound supervisor and music supervisor, Skip is also a songwriter, musician, record producer and music publisher with several top-ten records worldwide to his credit. Dave Mason, Survivor and Sam Harris are among those who have recorded his songs. He currently makes his home in the Nashville, Tennessee area; he was based in LA before that, where he owned and operated a successful studio. 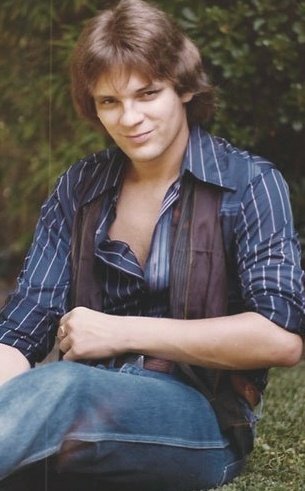 He’s worked on over 40 TV shows or movies, including The Wonder Years, Dawson Creek, and LA Law, and was nominated for at least one Emmy. 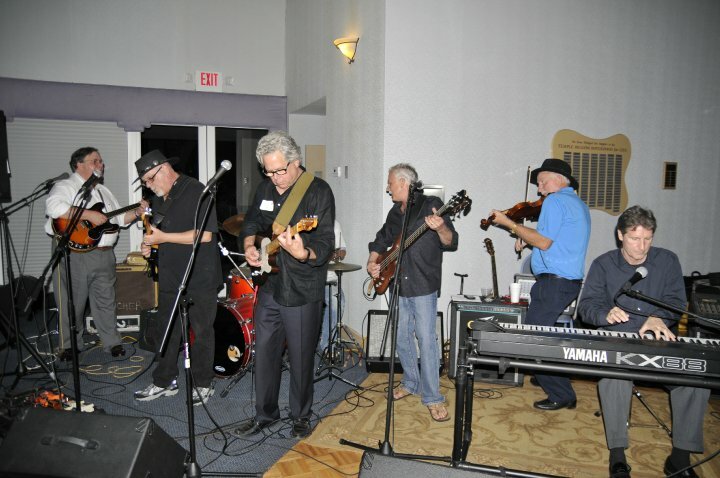 A few years ago we all gathered in Naples for our high-school reunion, and had the happy idea of playing acoustic music together one night at a Class of 1970 barbecue and then playing a few electric sets at the reunion dinner. 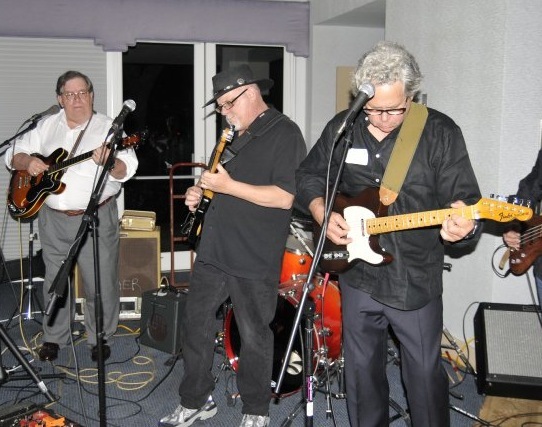 With Jeff Gargiulo as band director, alternating lead guitar with Skip, we rocked the joint to the point that folks not associated with the reunion stopped me on breaks to ask if we were for hire for other occasions down there! I played rhythm guitar on my old Mosrite electric and just tried to keep up. Another NHS rocker, Skip Reznor, played the keys, Mike Threlkeld was on violin, and Nick Koch came in on drums toward the end of the evening, giving the Miami session player Jeff had arranged for us a rest. We may have grayed up a bit, but we had ’em all on the floor dancing and laughing and that’s what it’s all about. I’d expected Skip to have grown musicially in the 40 years since I had heard him, but I was unprepared for what he came up with. It was so soulful, tuneful and advanced from what other guitar players I knew were doing that I was shocked. But Skip has always shocked people; he can’t help it. He zigs when the rest of us are trying to figure out how to zag. In his hands, which had always been more than capable, his guitar sang out clear, focused and elegant melodies that no one else could have come up with. Jim, Skip and Jeff; still rocking after all those years . . . 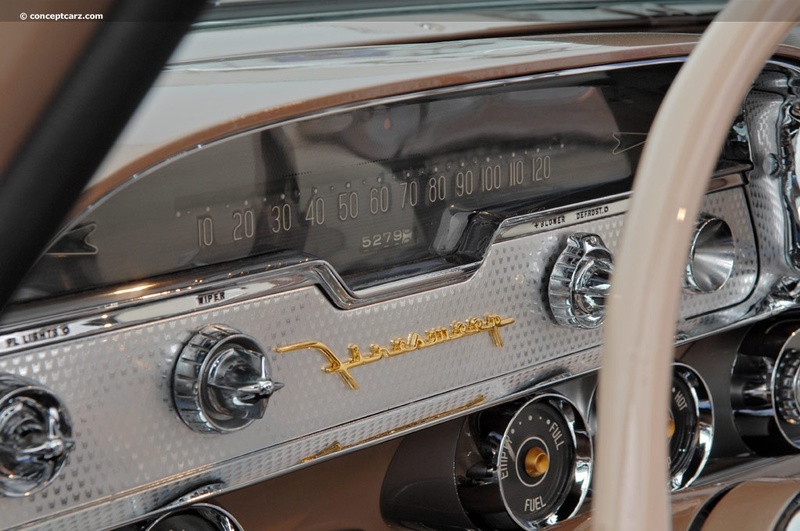 There were a lot of cool features to the DeSoto, but the push-button automatic transmission may have been the coolest. 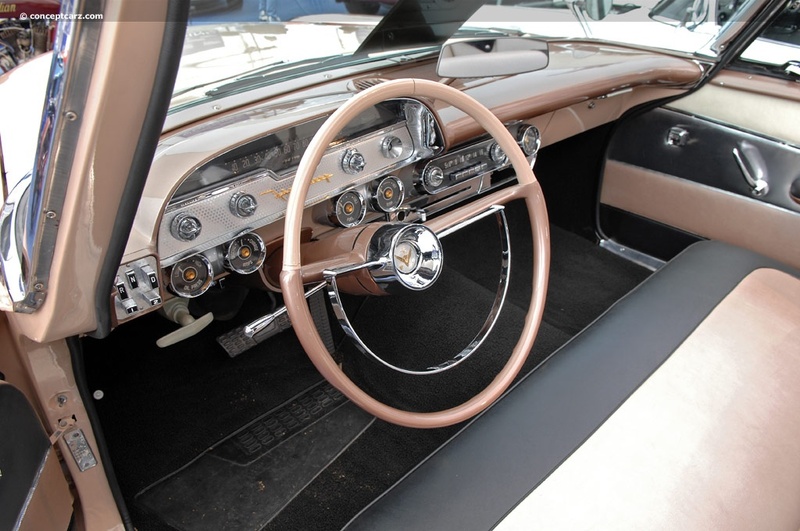 Here’s a Web photo of the dashboard; the transmission controls are on the left side of the dashboard. See ’em? Another dash photo. Look at the groovy knobs! Of course, this was before the government made car-makers have safety uppermost in mind when designing a dashboard. I’m not certain this car even had seat belts; I suspect it didn’t, unless my dad put them in later. He had an aftermarket AC put in and it worked so well it would fling ice at you from the rear deck. 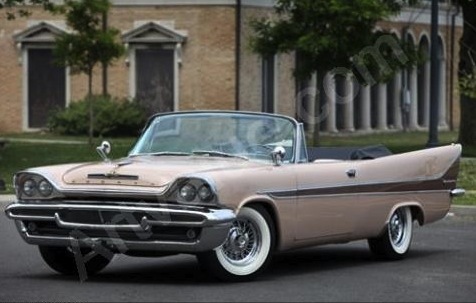 Here’s a great Web photo of some lucky person’s pink DeSoto convertible. How I would love to have that car!!! Many cars today look like little bars of soap rolling down the road. 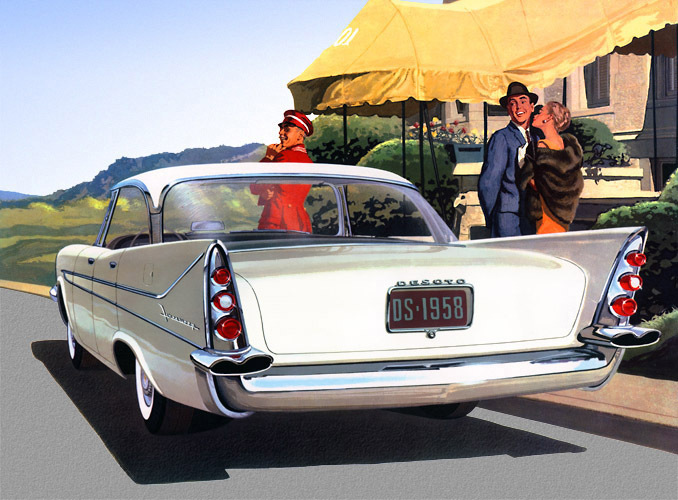 I loved it when cars looked like jet airplanes or the TV-show Batmobile! Many of us who grew up in Naples, Florida back in the mid- to late-1960s are still in daily contact and we have a lot of laughs. There was something unique about that out-of-the-way spot way down the left side of Florida. It was a strange mix: locals who lived there for the fishing or hunting or because they’d inherited a place jumbled together with the fabulously wealthy. Add in a few drug runners and such for spice. Through the years, Naples has grown and the average income has risen. In our day, we teens had to make up ways to have fun and we had a blast! I visited Naples for a high-school reunion a couple of years ago and it was a great week. We resurrected a variant of the high-school bands we had been in and played a few sets at the reunion dinner. 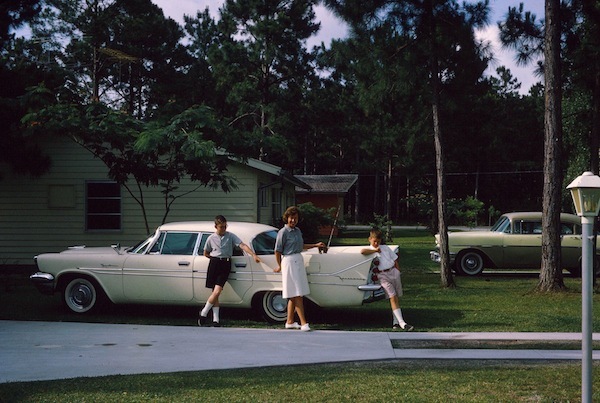 During the days, we’d drive around and marvel at how much the town had changed, but also at how much was still recognizable if you knew where to look. Earlier this year, I finished writing a fun mystery novel set in the Naples of those days, entitled Blood on a Sugar-Sand Beach. It’s on Amazon Kindle if you feel like taking a look. 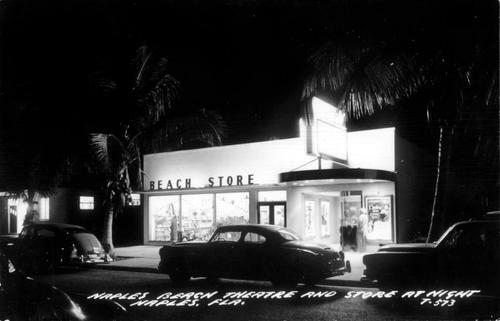 One day, some astute filmmaker will create a film about that town in that era; it should be something like American Graffiti meets Midnight in the Garden of Good and Evil, with a bit of M.A.S.H. thrown in to snaz up the dialog. There are a million zany stories and many of them are almost 100% true! Where are George Lucas and Steven Spielberg when you really need them?!?!?! I promised nothing political on this blog, and I plan to keep that promise, but this is more a funny story than a political one. In 1972, I was going to college in Boca Raton during the time of the presidential election. Richard Nixon was running for re-election against George McGovern. My assignment for class was to write a paper on the graphics of campaign literature, so my roommate and I drove down to Lauderdale to get some signs and pamphlets at various political headquarters. This friendly guy said, “Tell you what: Get a bunch of your friends together and we’ll send a bus up to Boca and you can attend the convention. We’ll even give you hot dogs and Cokes on the way down, and maybe some beer on the way back!” My friend and I were amazed. We looked pretty scruffy, being art students in those days. I was skinny, wore wire-rim glasses, big sideburns and a pony tail and my friend had an Afro. I said, “I couldn’t dress for it; my suit’s over in Naples.” The friendly man said, “No problem; casual is fine! The more casual the better!” So we agreed to go and spent the afternoon rounding up a dozen or so friends to go on this insane jaunt. We didn’t care much about the election but we thought the convention would be fun to see. The bus came, and away to Miami we went. At the convention, we were given very good seats on the balcony overlooking the speaker’s podium. The curtains behind the podium blew wide as President Nixon’s helicopter landed, and he came to the podium waving his V signs with both hands. My friends and I were having a great time. A few minutes into his speech, President Nixon– reading from his notes on the pre-teleprompter lectern– looks up, points to my friends and me, and says something like, “And you long-haired anti-American radicals, who burn flags and don’t support our military . . .” and the whole place just goes nuts! My friends and I were stunned. We weren’t in the least political but we did have long hair. A bunch of crew-cutted Young Republicans in suits on either side of us began yelling at us and shaking their fists and we felt very uncomfortable. As the president went on with his speech, we realized we’d been set up!!! We were window dressing; some operative probably had an assignment to get a certain number of seats filled by hippies so the president would have someone to point at. The photo here is from the Net. 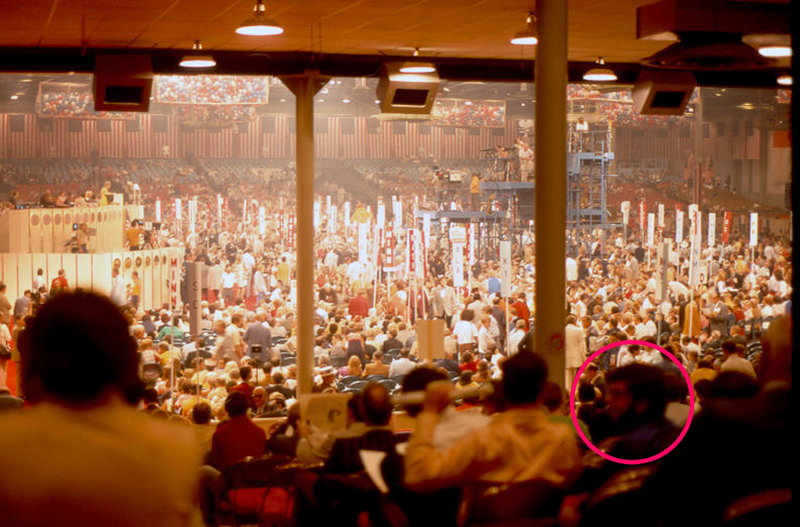 Inside the red circle is yours truly, with big sideburns, a ponytail and his best Gant shirt. This photo looks to be from after our moment of infamy, as I appear to be talking to one of the Young Republicans at the time the photo was taken. As a high-school kid, I’d fly up from Naples to New York City in the summers to do what I could at the comic-book publishers there. DC and Marvel were the biggies. DC was at 575 Lexington Avenue, and they wouldn’t give me the time of day; they were corporate. Marvel, over at 635 Madison Avenue, was more welcoming. 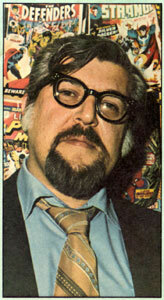 The wonderful man who took me under his wing, for some reason, was John Buscema. He was big, bearded and a bit scary at first to a green kid. And, man was I green. 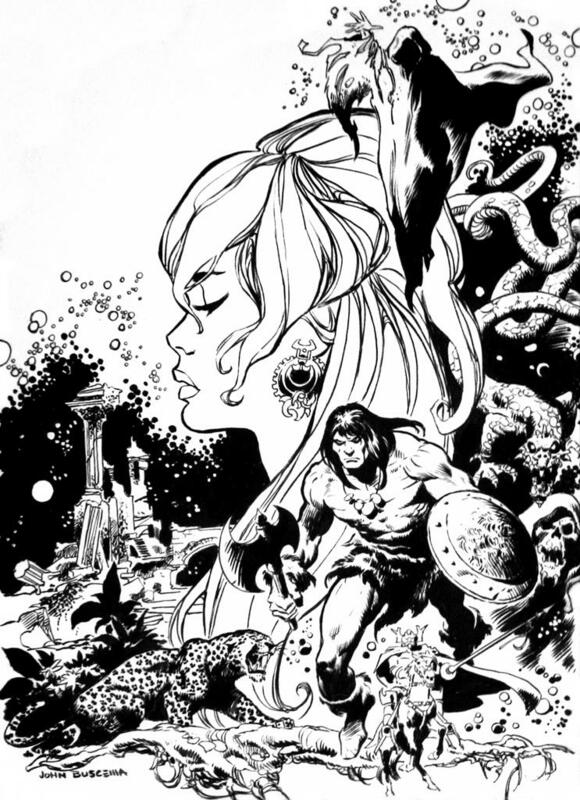 Within a few minutes, though, I realized that Mr. Buscema, in spite of his being a “real” comics artist– and one of the very best– was also a sweetheart and remembered what being green felt like. I worshiped him. I don’t know if he usually worked at the Marvel office, or was just there hanging out, but I was glad he was around! He didn’t give me a lot to do and what I did do I probably did to excess. 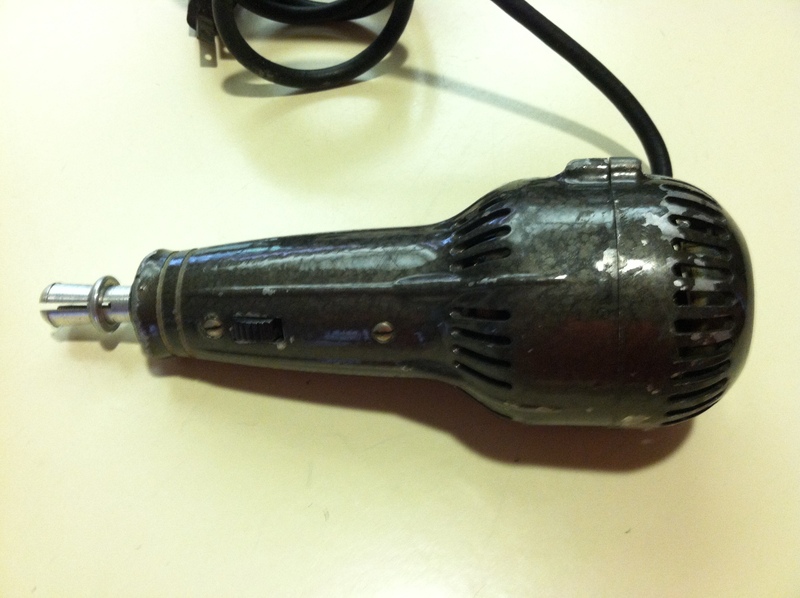 I bought an electric eraser and some various eraser sticks for it and reported in every day. 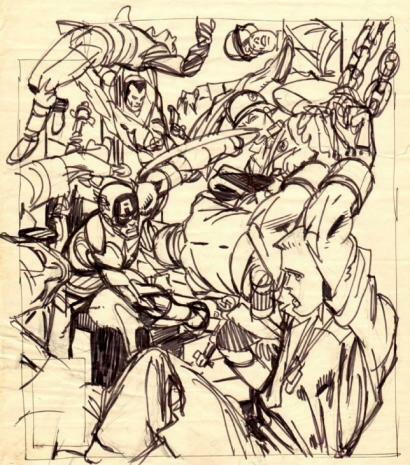 I remember cringing whenever I saw a Jack Kirby page ready for erasing after being inked. Mr. Kirby drew with the softest pencil imaginable on a plate-finish board and it was all a smudgy grey-graphite mess for me to clean up! But I knew in my heart that no; I would never get there. I didn’t want it bad enough. As I went back to Newark that evening I knew my comic-book career was over before it really started. But I also knew that I had gained a friend who was a rare person; a giant with a giant heart. 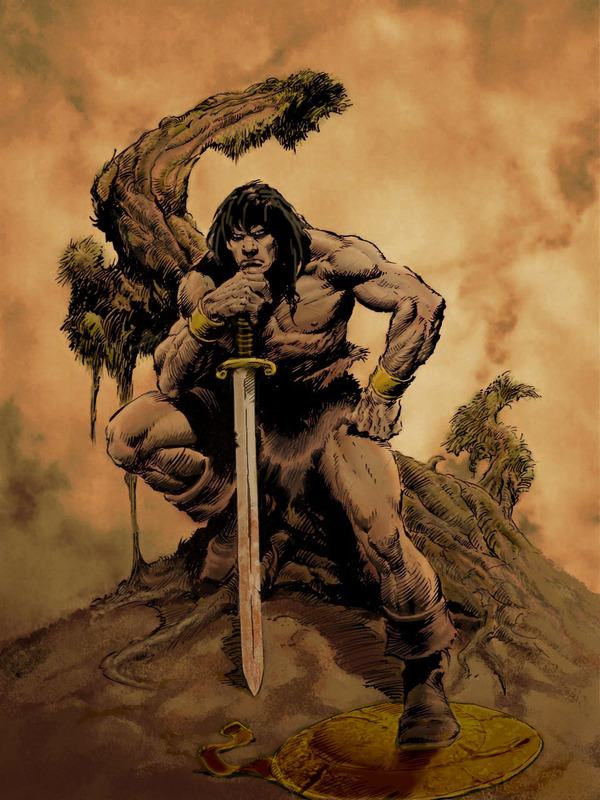 A wonderful man; best known today, I guess, for his work on the early Silver Surfer and Conan the Barbarian. These planes are large; the photo doesn’t convey a sense of scale. The lovely blue-and-white plane also shown is a Piaggio P-136-L1 seaplane, and it isn’t small. I’m willing to bet Dad was there trying to buy that smaller plane when he took the photo. Dad wanted to own one of these planes in a bad way; the second photo was taken by either my dad or me at an airplane graveyard out West. 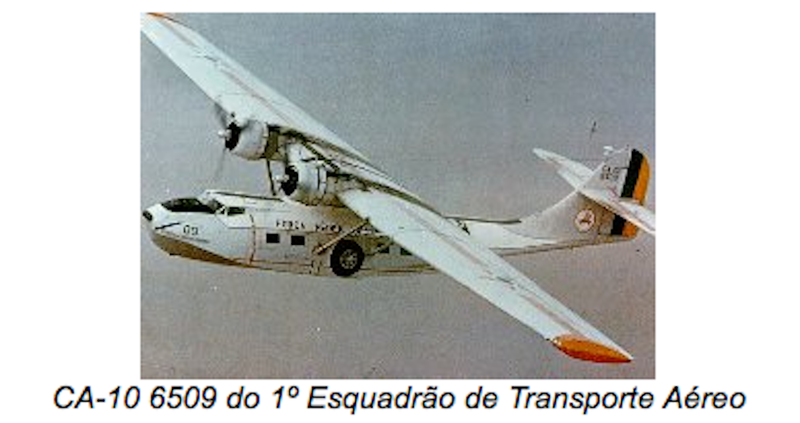 I was dragged there by my dad on a search for a PBY he could buy, but that’s a story for another day. Today, we’re discussing one particular aircraft. Here’s what I found on the Net. Planes can have a very long service life, as we are seeing today! 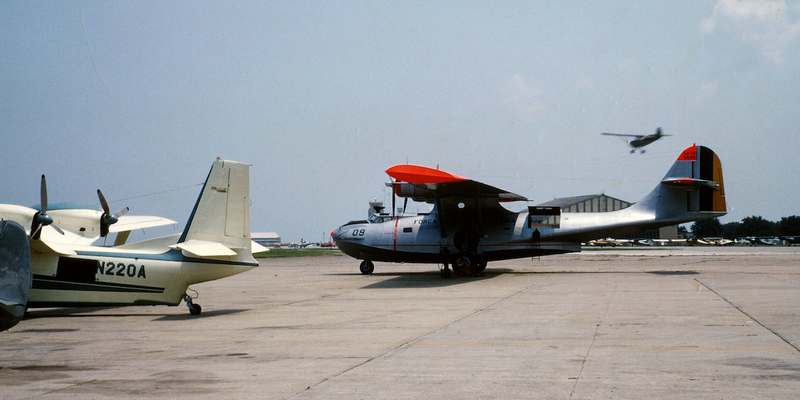 At some point in the last 20 years, this Catalina was purchased by the U.S. Navy and given a new registration. 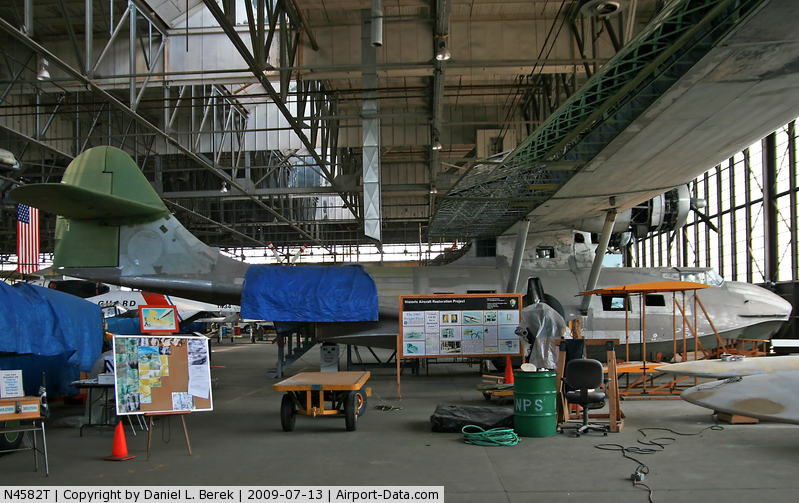 U.S. planes have a reg number with the letter N in front of the numbers; Brazilian aircraft use two letters in front of their registration numbers, but they all start with a P.
In this final photo, we see the same plane recently, being lovingly restored by volunteers at Floyd Bennett Field, in Brooklyn, New York. She’s currently at the National Museum of Naval Aviation, Pensacola, Florida, though she was in Long Beach, California for at least a while. Pretty cool for a plane that’s at least 68 years old. 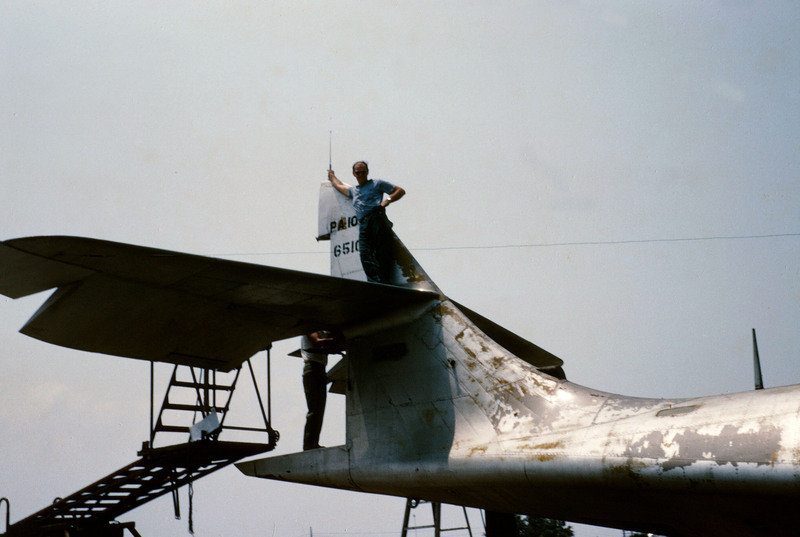 I’ll try to find a photo showing the plane after this restoration. Ladies And Gentlemen . . . The Beatles! And A Theory! When The Beatles appeared on the Ed Sullivan Show on Sunday night, February 9, 1964, it was a very big deal, at least to the kids in this country. Our family was living in Fernandina Beach, Florida, and for once, I put my foot down and told my mom we had to have a new TV. Our old one had conked out a couple of months before, and I wanted to see and hear The Beatles on TV. At that point, I was on the fence about whether I liked them or not, but I wasn’t going to miss out on the chance to see them and make up my mind. 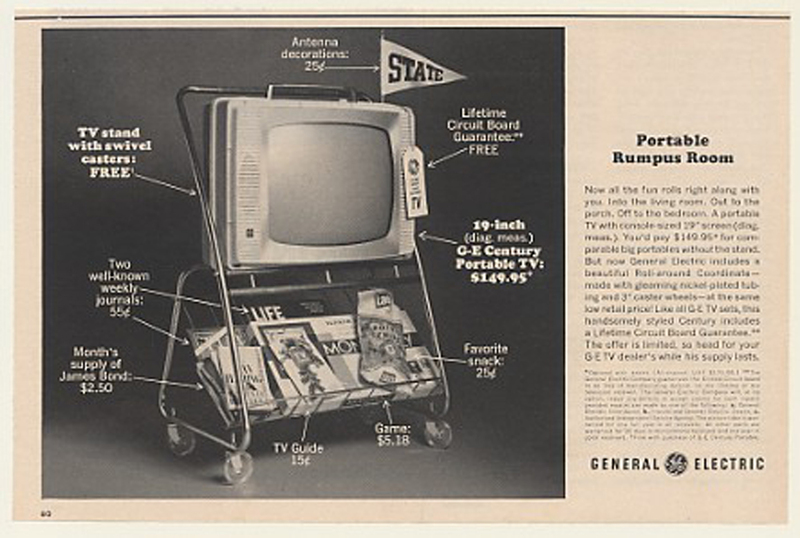 Amazingly, my mom caved in and bought us a new GE 19″ portable, and, of course, it was a black-and-white set, with the nifty stand as shown in this ad. Television wasn’t usually in color in those days; the first primetime TV season broadcast totally in color wasn’t until 1966. This was arguably the most important television session The Fabs ever did; it was their first chance to perform in the United States and Ed Sullivan was the (then) most popular show on TV. Now here is something I think is pretty obvious, but I’ve never seen it written about or discussed elsewhere: I firmly believe John’s mike went out on him during the last song (I Wanna Hold Your Hand). The key to this: Watch George! I can hear the audio change about 11:22 in this clip and after that point, all I hear in the vocal mix is Paul. I also think you can see at about 11:55 George is starting to realize something is amiss. If you don’t want to watch the whole clip, just move the slider at the bottom of the view to the time markers I indicate! Listen carefully to the vocals beginning at 11:58; that should be a two-part harmony but all you can hear is Paul’s part. I contend that George realizes at about 12:00 that John’s singing into a dead mike and starts laughing at about 12:05. No matter; they sounded great and by the end of that show, The Beatles had done what they had set out to do: Become the first British rock-and-roll band to be taken seriously by U.S. kids. As for me, I was convinced The Beatles were something new, different and exciting, and thus began my quest to switch from playing an alto saxophone to an electric guitar. That theater, on Broadway between West 53rd and West 54th in Manhattan, has a wonderful history. Opened in 1927 as Hammerstein’s Theater, it was converted in 1950 to use for television and was renamed CBS-TV Studio 50. Now it’s called the Ed Sullivan Theater and it’s home to David Letterman’s Late Show. Joe Kubert Has Passed . . . The Office May End, But Scanton Lives! Well, Shakespeare, He's in the Alley . . .